How do I sync playlists from iTunes to my iPod, iPhone, or iPad? How do I use AirPlay with Joobik Player? How do I change the Duration of track title display, or switch it off? I use iTunes Match, why can't I access all playlists synced to my iOS device? Why doesn't Joobik Player play all my videos synced to my iOS device? Why doesn't Joobik Player show all my videos synced to my iOS device? Why can't I see my iTunes videos in Joobik Player, even though they are not DRM protected? Why is there no audio while playing a video with Joobik Player? Could we get play count syncing with iTunes? This article is available from the Joobik Blog. 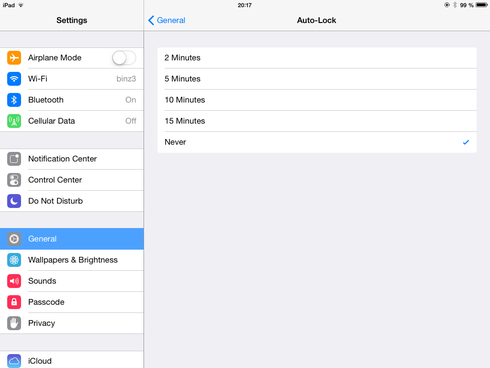 To use AirPlay with Joobik Player, please disable your iPad's / iPhone's Auto Lock feature in the device settings app. Otherwise Joobik Player would stop playing on AirPlay when the iPad's lock screen appears. 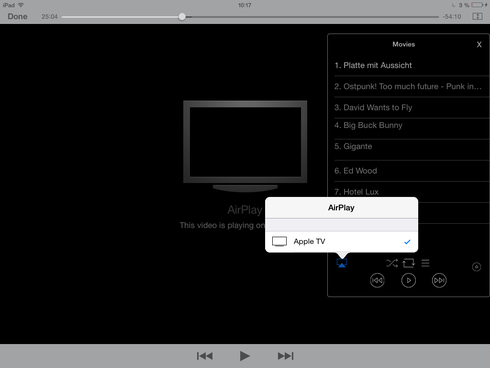 Then start playing a video with Joobik Player, and start AirPlay from Overlay Playlist Controls. Joobik Player will display video track title and artist for a configurable period of seconds each time a video starts playing. Here is described how to configure this time interval. After updating your iOS, please terminate Joobik Player completely from the list of running Apps. Then switch your iDevice off and on. Syncing should now work as usual. iTunes Match behaves delicately when bothered with playlists. When iTunes Match is turned on on your iOS device, it will let you access playlists synced to iCloud only. Locally synced playlists will not appear. Detailed background information and workaround instructions are given in this blog post. 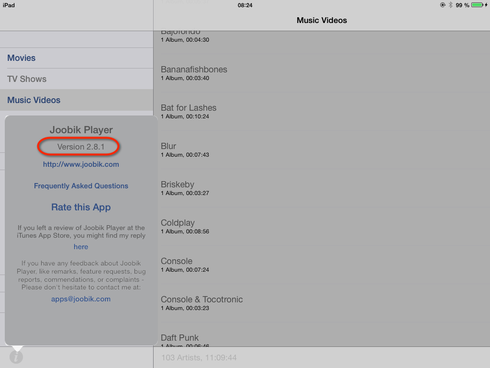 Joobik Player will not be able to access iTunes Folders when iTunes Match is on. So all playlists will appear in a flat list under the "iTunes Folders" menu. Joobik Player cannot play any video protected by Apple's Digital Rights Management (DRM) called FairPlay. Apple restricts access to DRM protected content to their own apps only. No 3rd party app will be able to play DRM protected content on the iPad or iPhone. ﻿Depending on the iOS version installed on your device, Joobik Player will be able to recognize DRM (Digital Rights Management) protected videos or not, so Joobik will display protected videos in playlists, or hide them. But they cannot be played and will be skipped during playback. Which videos are protected by DRM depends on the country of the iTunes Store you are using. In some countries TV Shows and/or Movies downloaded from iTunes use DRM protection. In some countries even Music Videos might be protected. Content you did not purchase from Apple, but did import into iTunes by yourself usually is not DRM protected. Please follow the instructions in this F.A.Q. 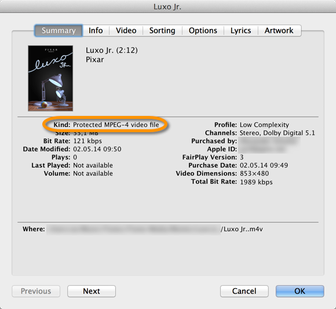 answer to check your videos for DRM protection in iTunes. Depending on the iOS version you are running, some of the videos synced to your iOS might not show in Joobik Player, or will be skipped when you try to play them. This will happen with videos protected by Apple's Digital Rights Management (DRM) FairPlay. Apple do sell some of their videos with DRM, some without. This policy differs from country to country. E.g. in Germany they usually sell music videos without DRM, but movies and tv shows are DRM protected. Depending on where you live some of your purchased videos might be DRM protected. You can check this in iTunes by inspecting the "Kind" property on a video. If it reads something like "Protected video file", Joobik Player will not be able to play it. Please check all of the videos not appearing in Joobik Player for the "Kind" property in iTunes. If all of them are protected, Joobik Player may hide them, or skip them during playback. This is a restriction by Apple. They only let their own apps access DRM protected content. If you find any unprotected video not appearing in Joobik Player, this F.A.Q. answer might help. First of all: If you're using iCloud to sync videos to your device, a video must have been completely downloaded to the device in order to appear in Joobik Player. Currently, you cannot download videos in Joobik Player directly. Use the standard Apple Video App for downloading. This problem seems to become more urgent since the update to iOS 7. The reason is the media kind of your videos. Recently, Apple changed the default media kind of videos added from other sources than the iTunes store to iTunes. It used to be "Movie", but they changed it to "Home Video". Joobik Player prior to version 2.8 doesn't support the "Home Video" media kind. To make your videos appear in Joobik, you have to change their media kind to one of the supported ones: "Movie", "TV Show", "Music Video", or "Podcast". You change the media kind of a video in iTunes by opening its info dialogue (CMD + I on a Mac, or right-click the video and click "Get Info" in the context menu). On the Options tab, you can set the media kind. 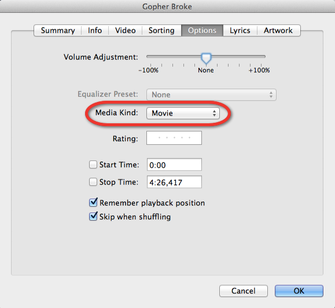 You also can set it in bulk to multiple videos when you mark them in iTunes and open the info dialogue on all at once. Once the media kind was changed, resync iTunes with your iPad. The videos should appear in Joobik Player now. Why is there no sound while playing a video with Joobik Player? With iOS 7 there was a slight change in handling of application audio. Each app will now control audio volume separated from device audio or other apps. To enable audio again, change the volume using the volume switches of your device while Joobik Player is playing a video. 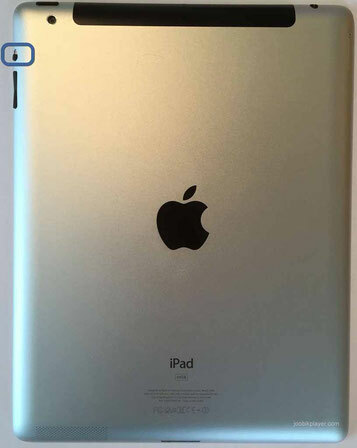 Make sure you have the Mute Switch of your iPad/iPhone/iPod switched off. If you still cannot hear audio, switch the Mute Switch on and off while Joobik is playing. Please note that the most recent iDevices have no mute switch anymore! These can be muted and un-muted from the Control Center. Some third-party accessories (e.g. cables or dock connectors) will mute audio as well. Please remove all accessories from your device and check audio again! Sorry, this is not possible. While I can read the play counts of a track synced from iTunes, Apple does not allow third party apps to modify it and sync it back. The only thing I could do is to build a separate play count into Joobik Player. Please send an Email to apps@joobik.com if you'd like to get this feature.